Exclusive! Pajamas—or loungewear? You decide. Updated top has a split neck with contrasting band, 3/4-length banded sleeves, and stylish A-line shape that dips longer on the sides. 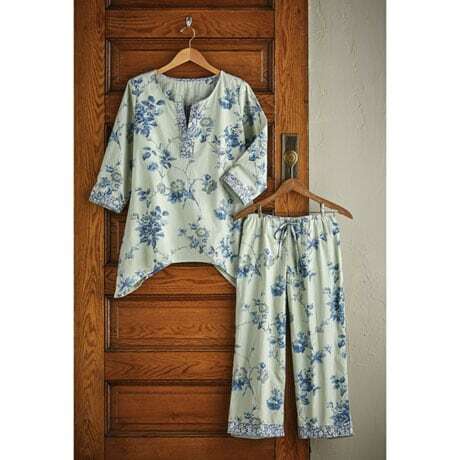 Pants have an elastic drawstring waist and 21" inseam. Crisp, cool 100% cotton. Sizes S(4-6), M(8-10), L(12-14), XL(14-16), 1X(18-20), 2X(20-22). Machine wash. Imported.